The otter is one of the most beloved semi-aquatic mammals with its playful gestures and cute appearance. As a member of the Mustelidae family, it's kin to weasels, badgers, ferrets and mink. Yet unlike some of its cousins, the otter does not hiberate. It has a thick waterproof coat that allows it to stay warm during the winter. According to Defenders of Wildlife, otters have the densest fur in the animal kingdom. They even appear to enjoy the icy season by frolicking and remaining active. There are 13 different species of otters, the most well-known being the North American river otter and the sea otter. The marine otter, once heavily hunted for its pelt, is now on the endangered species list, according to the International Union for Conservation of Nature. 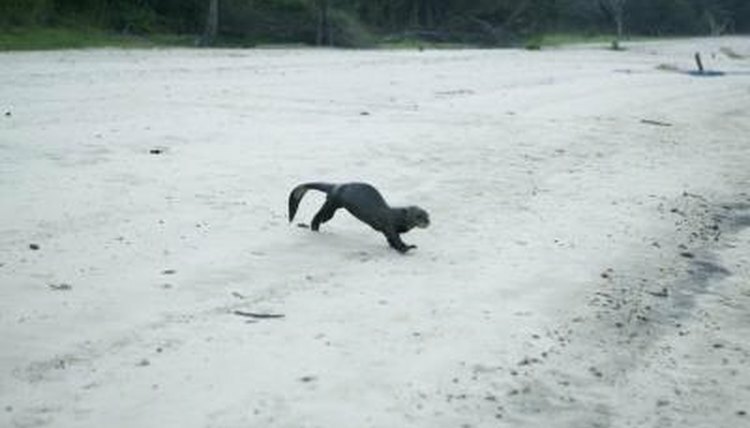 The India smooth-coated otter, giant otter, hairy-nosed otter and southern river otter have been listed as vulnerable by the IUCN. Besides hunters, otters' food sources are often compromised by fishermen depleting their supply. Through public education and awareness, most species of otters should remain safe from extinction. Scientists purport that otters have been on Earth for more than 30 million years. Otters can be found on five of the seven continents: North and South America, Europe, Africa and Asia. All otters live close to exceptionally cold fresh water or salt water. Their homes are called "holts" and are similar to burrows. They prefer living near wetlands or woods for protection and safety from predators. Otters are carnivores and primarily eat fish. They will, however, eat crabs, birds, crayfish, frogs and even lizards. Otters eat 15 to 25 percent of their body weight each day and can spend up to five hours fishing for food. Their facial whiskers help them catch prey by sending vibrations as they float in the water. Their sensory perception combined with retractable claws and quick reflexes, make otters master hunters in shallow waters. Otters are generally three to four feet in length and weigh between 10 and 30 pounds, depending on the species. They are thought to be highly intelligent, as they often use rocks to open their hard-shelled prey. Otters are nocturnal and spend their days sunbathing, becoming active at night. They can dive up to 250 feet and remain in water for up to four minutes. Otters have been known to show characteristics of human behavior, such as holding hands. Cute, savvy and intelligent -- what's not to love about otters? Kay Curtis began writing professionally in 1988. Specializing in advertising, her work has been published in several trade magazines including "CompUSA Direct," "Dance Teacher Now" and "Travel." Her news articles and columns have appeared in "The Battalion," "The Lakeshore Times" and "The Beacon." Curtis has a Bachelor of Science in journalism from Texas A&M University. What Kind of Adaptions Does a Dolphin Have? What Is the Difference Between Otters & Beavers? What Eats a Dugong in the Barrier Reef? What Kind of Animals Live in Ice Caps? How Does a Platypus's Fur Help Underwater? What Is the Difference Between a Bottle-Nosed Dolphin & a Porpoise?